This delightful four bedroom, three bathroom property is situated in a quiet gated community, the Sanctuary. Its pool and extended deck overlook a conservation lake. It is two miles from Champions Gate Golf Resort, and six miles from the Disney theme parks. The villa features a large, open plan living space, incorporating a dining area and fully equipped kitchen and comfortable seating, with cable TV, DVD, stereo system and iPod Player. The south facing pool (heating optional) is surrounded by a large deck, which allows sunbathing from sunrise to early evening, overlooking the tranquil lake and offers great al fresco dining and evening relaxation opportunities. The bedrooms have two king size beds and two sets of twin beds. All bedrooms have walk-in wardrobes and easy access to bathrooms (en-suite for the master bedroom). The games room offers pool/billiards, table tennis and darts. The house has unlimited free outgoing calls to USA & Canada & free wireless broadband access. There is also a travel cot, highchair, and a security safe should you require them. Free virtual video tour: For further details of Balmoral Lake, including a virtual tour of the property and a large number of still photographs, together with details of local facilities, including golf, Disney resorts and some of the local wildlife inhabiting the conservation lake. I live in the Southern part of the UK with my husband and teenage son. We thoroughly enjoy Florida, and work hard during the year, so that we can enjoy our trips out to the villa. We bought this property as it was the perfect size for both us and our renters. We fell in love with the view and tranquility from the first moment we viewed it. We love the view, peacefulness, and extra large deck. The villa is a fantastic size for a single family or two families holidaying together. Balmoral Lake is conveniently accessible for Disney, the coasts and golf. There is a supermarket, drug store and five restaurants within a one-mile radius. You can get away from it all by sunbathing on the south facing pool deck, which overlooks a tranquil conservation lake. This is accessible from patio doors from both the living room & the master bedroom. There's a large poolside table with up to four comfortable poolside chairs for al fresco dining, and up to four full-length loungers for soaking up the sun. There's a shower on the pool deck, to clean you down and freshen up. There is 100+ channel cable tv in the living room and in two of the bedrooms. There is unlimited free telephone calls to USA and Canada, and free wireless internet for all guests. The Homeowners Association maintains all gardens within the Sanctuary development, ensuring a totally clean & pleasant local setting. Guests are requested to refrain from smoking in the house, but may on the pool deck. We were very pleased with the home and location. We enjoyed the walking neighborhood, the comfort of the home, and all of the wildlife we could see. Our family of 4 stayed at the Villa for 2 weeks end of October, start of November. This is the second property we have stayed at in the Sanctuary and it did not disappoint. The Villa was neat and tidy upon our arrival, very comfortable and nicely decorated. The pool without rear neighbors is a gem! We were even joined by another family of 4 for a few nights and we never felt short on room! Communication with the owners and Management Company was top notch! We can't wait to come back. The property was fantastic and contained everything you would need during our stay. The property was fantastic and was situated in a great location overlooking the conservation area. It was spotless on arrival and the furnishings were very comfortable with plenty of towels for use. I have stayed in several properties within the Sanctuary at West Haven and this ranked amongst the best. I would definitely recommended to others for use. Brilliant villa with large pool deck close to Seaworld, Disney and Universal. We spent a fantastic two weeks in this wonderful villa in a gated community close to the I4 linking us to all that Orlando has to offer. The villa is spacious and well laid out with everything on hand you would have at home and a well appointed kitchen. It is very comfortable with a large living area and big bedrooms. As a family of 4 we had lots of room to spare. Dympna was always at the end of a call or email for guidance and we felt this was a home from home. I can highly recommend this villa. It provides a welcome sanctuary after the madness of the parks and outlets ! The villa is immaculately presented, both outside and inside. Located on the Sanctuary at Westhaven, it is easily accessible from the I-4 interstate, and is only 10 minutes from the Disney parks, 30 minutes from Orlando International airport, and an hour from the beautiful coasts that Florida has to offer. There are endless options for eating nearby, along with a selection of supermarkets. Dympna has created a welcoming place for your holiday, the perfect place to spend time relaxing - with a lovely pool deck and clean pool, games room, comfortable living space and bedrooms - or simply a base for the rest of your holiday plans. This villa exceeded our expectations! Dympna is very kind and easy to communicate with, thank you for a wonderful stay! Balmoral Lake is situated six miles from the Disney World resort and just two miles from the ChampionsGate Golf Resort and the David Leadbetter Golf Academy. 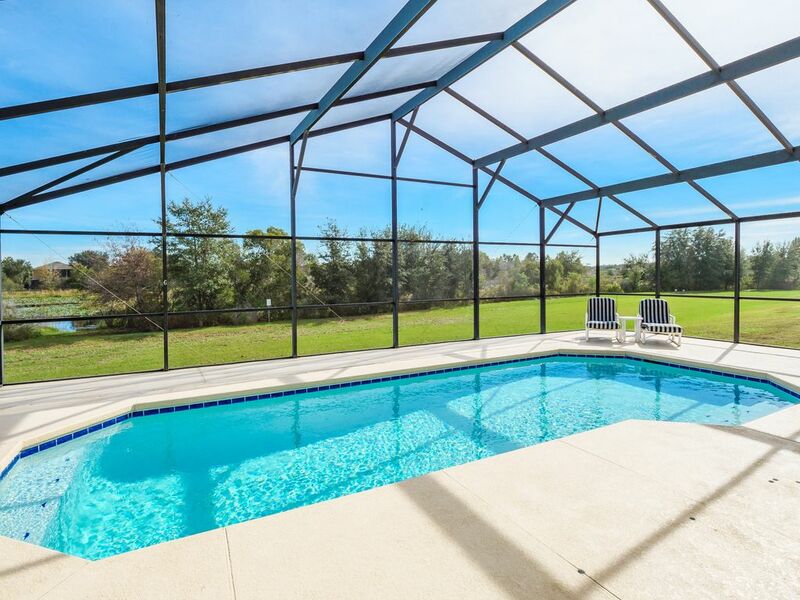 The villa is a 35 minute drive from Orlando airport and about an hour's drive from Florida's Gulf and Atlantic coasts. Golf: Balmoral Lake is a two mile drive, or pleasant half hour walk from Champions Gate Golf Resort and headquarters of the David Leadbetter Golf Academy. The 36 hole course features an 18 hole links style course and an 18 hole traditional American course. The course is open to members of the public and offers pleasant dining facilities. There are dozens of other golf options within a half hour drive of Balmoral Lake, offering a wide range of challenges for any golfer, no matter how experienced.